Furniture and shelving solution for a new academic and creative hub. 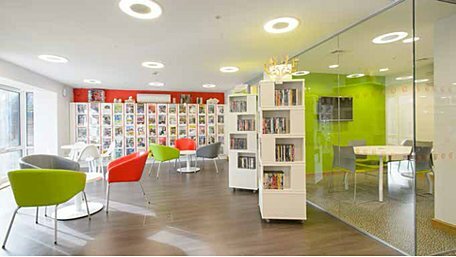 Thedesignconcept provided a furniture and shelving solution for a new academic and creative hub for Sixth Form students at the College. All desking was provided with surface mounted power allowing each station to be used with a fixed PC or left free for students to plug in their own devices via socket or USB points. A purpose built magazine and journal wall was provided to allow the clear and attractive display of content with the ability to store archive issues. Furniture was also provided for the student kitchen.